Mold is a serious potential health hazard, but did you know that different types of mold can cause different problems? Do you know what symptoms to look for that might be the reaction to mold? Below are what to look for to identify 4 of the more common species of mold that may negatively impact your physical health and your home’s well being. 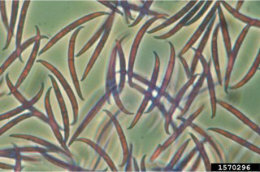 Stachybotrys grows in areas rich in cellulose that have been exposed to high levels of moisture for a prolonged period of time. It appears black with either a velvety or slimy texture. 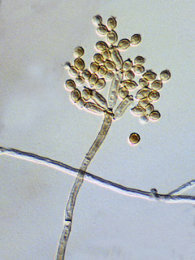 Cladosporium refers to roughly 500 species of mold frequently found on rotten organic matter, and typically appearing as green, brown or black spots. 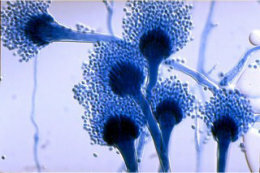 Aspergillus is the most common type of black mold, and can appear as anything from a yellow to a black mass, with specific species being identified by the color of their colonies. 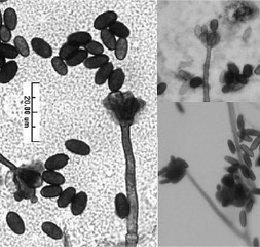 Fungal Ball (a mass that develops in the lungs and can cause hemoptysis,wheezing, shortness of breath, weight loss, or fatigue. If you suffer from these symptoms, seek professional assistance. If you suspect a mold to be growing in your home, contact a professional to perform tests to make sure, and protect yourself by containing the mold site with a product such as MoldHold. If you notice symptoms and think you might be having a physical reaction to mold in your environment, go to your doctor with these concerns to catch anything that may be going on before it gets worse.